Could Rob Ryan be on the inside track for a job with the Bills? When defensive coordinator Rob Ryan was fired by the New Orleans Saints in November, Bills head coach Rex Ryan joked that he’d be interested in bringing his brother to Buffalo. "Not going to lie, it would be fun," Rex said last month. On Monday, Rex again hinted at the possibility of adding Rob to the Bills’ coaching staff. 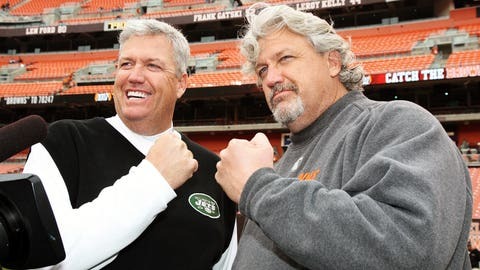 "There’s probably some truth to the rumor that Rob Ryan is in town in Buffalo," Ryan said during his press conference. Of course, Rob could be in Buffalo for reasons other than football, but it’s interesting nonetheless. The two haven’t coached together since 1995, when they were on the Arizona Cardinals staff working under their father, Buddy Ryan. Rob hasn’t had a great deal of success of late, though the Saints haven’t improved since firing him. Still, Rex has plenty of confidence in his brother, calling him a "great coach" last month.